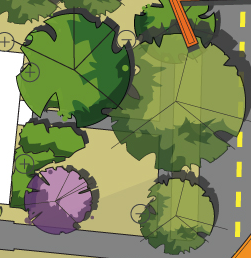 After posting about Site Analysis with Detail Components, someone asked if the following graphic/ trees were made in Revit. The short answer is probably not (though I honestly do not know, since I did not make this lovely graphic). 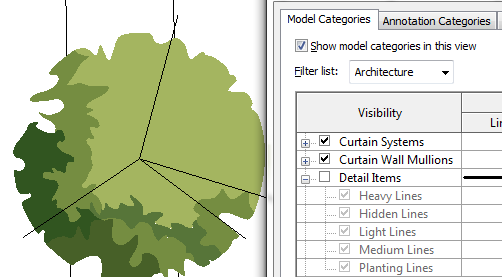 But the question made me wonder, could you make a scaleable tree symbol like that in Revit in reasonable amount of time? Turns out, yes, you can. So the concept behind a complex, scaleable planting symbol combines topics that I’ve covered in two previous posts: Plant Graphics – Symbols and Color and Scaleable Landscape Families. Essentially it involves creating a scaleable, spline-based detail component, based around a reference plane framework, and then nesting that into a planting family. The framework and constraints are time-consuming, but I was able to make this family in the better part of a morning (less than 3 hours). 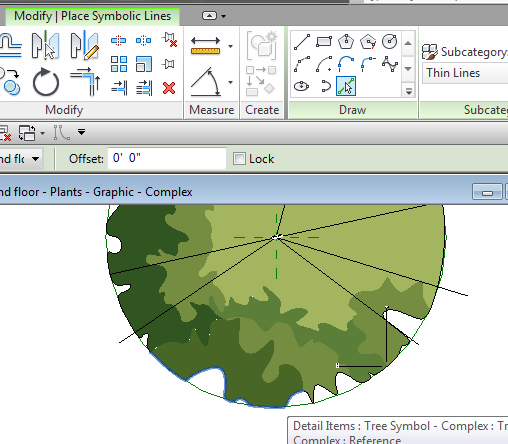 UPDATE: There is a much quicker workflow for creating a complex scaleable graphic, please see my updated post, Complex Planting Graphics, Simplified. This updated process can be done in 20 minutes or less. You could easily make one less complex than this in much less time. 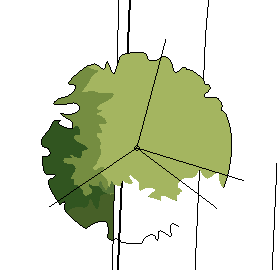 To start off, insert a picture of a tree graphic (having something to trace like this is a big time saver). Then, draw a reference circle with a nice diameter to match the image. Now, for the next part you need to identify all of the sub-areas within the symbol. If you look at the final product (below), you can see that I simplified the symbol somewhat. In general, the less sub-areas the easier it will be to make. I settled on 7 sub-areas, including the largest light green area. Starting with the outside boundary, these are the points along the circumference where the sub-areas change. In the interior, it is a little more complicated, but there are less of them. THEN, you have to constrain them all relative to the diameter (I would recommend making your dimensions transparent). Yes, it is a long list, but it really doesn’t take very long to do. Use your calculator and copy clipboard to your advantage, so you can just hit Ctrl + V when typing in the Formula. I started off drawing the outside boundary, but you can really start anywhere. 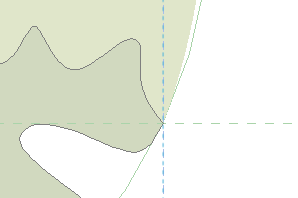 The spline must be continuous between reference plane intersections. I also decided to have no overlap between regions. This mainly requires some copy and pasting of boundaries between filled regions, but is otherwise not much more difficult. The result is that the tree appears very similar when transparent. If you had any overlap it would show with transparency (though I’m sure that you could do it intentionally with good results). As usual, you cannot have both transparency and shadows. 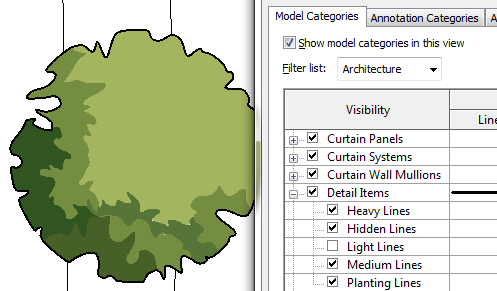 When making the Filled Regions, make sure the Background is set to Opaque, otherwise your tree might look a little empty once loaded into the Project and on Topo. 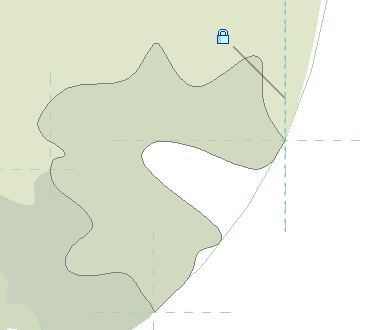 In this tree on the right, only the lightest green is Opaque and the Transparent regions disappear behind the Topo, as you can see when it’s on the edge of the Topo. Finally, you want to make sure that you are constraining the endpoints of the splines to the reference plane intersections. This is where the Align tool (AL) is highly useful. 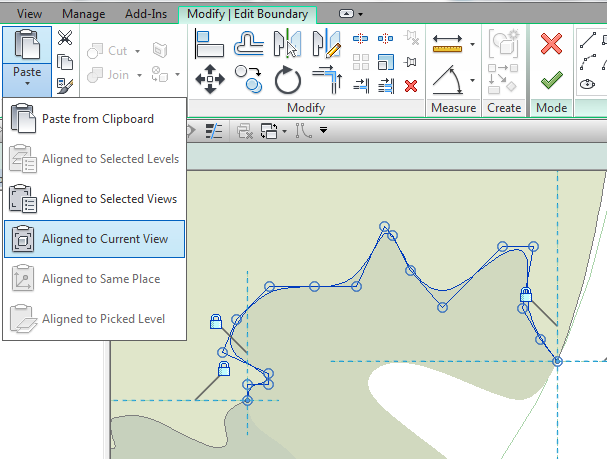 If you’re unfamiliar with Align, you want to select the reference plan first, then the endpoint of the spline, and then lock the constraint icon. Do this for both the vertical and horizontal planes. Once the areas are all drawn and constrained to scale, all that is left is the linework. There are two options for linework: leave it in the detail component or do it in the Planting family. The first option is the quickest, since you can just use the filled region boundaries for the linework, but it results in the lines being controlled from the Detail Items Category and/or a detail item Subcat, such as Light Lines. In the above Planting family, the inner symbol lines are on Light Lines within the Detail Component, and will disappear when the Light Lines Subcat is turned off. However, it is worth noting that when the entire Detail Category is turned off, the Light Lines will still remain visible if it is checked. And the entire Family is still controlled from the Planting Category, so if Planting is turned off, the entire family (linework and all) disappears. I prefer to use the second option of putting the linework in the Planting family. It takes a little more time (at least for the main outline), but it results in a cleaner family, that is entirely controlled from the Planting Category. 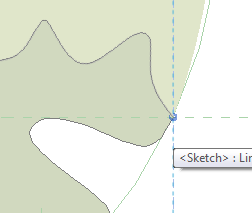 The outline can be traced using Pick Lines (and Tab to select) and then constrained to the nested reference planes (now called Shape handles). And that’s it! If you want to check it out, here it is, but be aware that the color fills will only be visible when the view Detail Level is set to Fine. 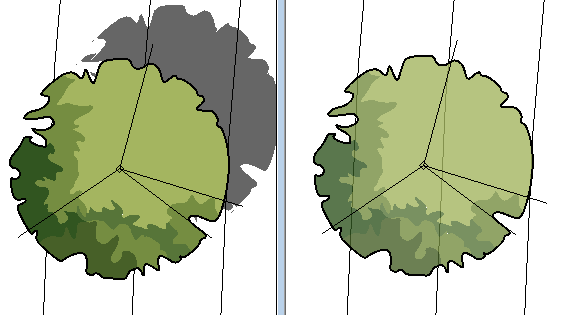 UPDATE: There is a much quicker workflow for creating a complex scaleable graphic, please see my updated post, Complex Planting Graphics, Simplified. Thanks it really answered my question. Beautiful work! Are you aware that you can nest a planting in a planting to take care of the scaling? Yes, I am quite aware of that and looked into that option. However (from what I can tell) the width cannot be controlled separately from the Height if it is done that way. So while that may work for some plants, it does not work for all of them. I’m a spanish speaker, so my english is very bad, I hope you understand. Well the last year (December), I worked in a project that require some trees at color, so I create a new family (Detail family) with some parameters, it’s very simple, because I have no time for complexity. The project and family are created in Revit 2015 Spanish, so the parameters are in spanish. I hope you can work with that. We’ve found a problem with this family (a Revit problem rather than a Landarchbim problem…). 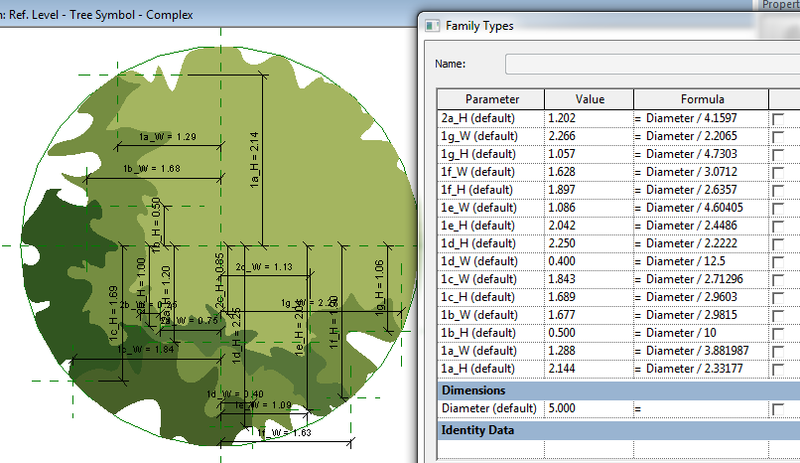 The 2D detail item casts a shadow in plan views that does not represent the tree height. It’s off by a factor of 10 at least compared to neighbouring elements. Place one of these next to a building, and the tree shadow will be offset ten times further than the building shadow. 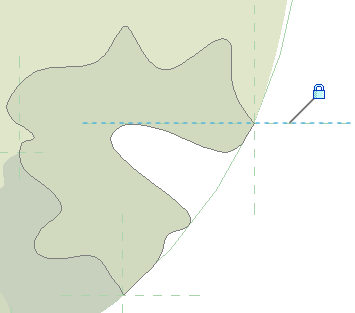 After investigating further, it seems the shadow offset of the 2D item relates directly to the upper limit of any 3D geometry, but that Revit incorrectly scales this by an unknown factor. You’re right. Now that you mention it, I have seen this before but I hadn’t really paid attention to it. From what I can tell, it seems to be doubling the height for the 2D component. If you set the reference plane height to be half the planting height, it seems to be close. Though in general, the shadow of the 2D component starts to fall apart graphically once the planting gets quite large (around 90’/ 30m). But that is what happens when you generate a shadow from a 2D object. Great tree family! I wish Autodesk had stock planting families like this. I do have one question about this however. I placed your family in my project and I can’t get the green color to show up in my site plan. I have my Detail Level set to Fine as you mentioned. When I am in Shaded view, it just shows up as plain white, but for some reason in Hidden Line and Consistent Colors view is shows up as green. Even this green does not show the layers of green that I can see in the Family Edit mode. Perhaps you mean Realistic and not Shaded? I just tested this out and the color shows in a Shaded view. However, it does not show in a Realistic view because the color is a filled region- not a material. 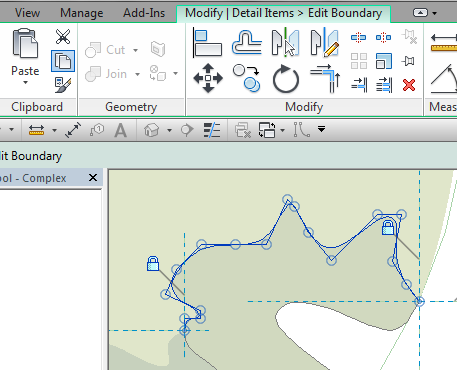 If you want it to display a material you would need to create the plan symbol from actual solids. You could certainly do this, but you would probably need to assign it to a separate Subcategory so that it would only show in plan views. Thank you for the reply. I played around a bit more this morning and for some reason it is now showing up with color no matter Visual Style I am using, from Wireframe through Realistic. I honestly don’t know how I managed this but that’s cool. It still isn’t showing the layering of greens that is in the family edit mode, just a solid mid-tone green. Hovering over the tree shows the outline of the green layers but it all displays the same. I can’t figure out how to make this level of detail show up so I guess I will just have to stick with what’s here. If it is all green but you can see when selecting or hovering, then it is the layering in the detail component. You’ll need to go open the nested detail component and adjust the order of the filled regions. Not sure why the layering is backwards for you, though. AutoCAD loses draw order information after certain operations. Revit probably suffers from a similar malady. So I went into the nested detail component and reversed the order with no change. So I just went ahead and switched it back to the correct draw order and it worked after uploading it! No idea why it was being so finicky, but everything seems to be working great now. Thanks again for your help! I truly appreciate it. Strange. It is a slightly older and perhaps more finicky workflow for nesting a scaleable graphic. If you plan to create others be sure to check out my latest method and family. I think it might be more stable. Alright, I definitely will. Thanks!